The town of Rickmansworth takes its name from the Saxon landowner 'Ryckmer' and 'worth' meaning farm or stockade. Over the years the name has recorded under at least nine different variations of the word, and finally settled on the current spelling many centuries ago. The town sits in the Three Rivers District of Hertfordshire. The rivers Gade, Chess and Colne were crucial in the establishment of most of the town's traditional trades. Watercress was a major trade as it grew in abundance on the banks of the rivers. The rivers provided the power required for corn milling, silk weaving, paper making and brewing. All of these trades have now disappeared from the area. In the early 1920s, gravel, which was used in the construction of the original Wembley Stadium, was extracted from a site to the south of the town centre. When the gravel extraction ceased, the remaining holes filled with water from natural springs, forming lakes. Ever since the 1930s, there has been a history of sailing on them. The lakes (Bury and Batchworth) are now part of the Rickmansworth Aquadrome which is a 41 acre Local Nature Reserve. They provide home to many waterfowl including herons, moorhens and swans, and host a variety of watersports including sailing, windsurfing, canoeing and water skiing. 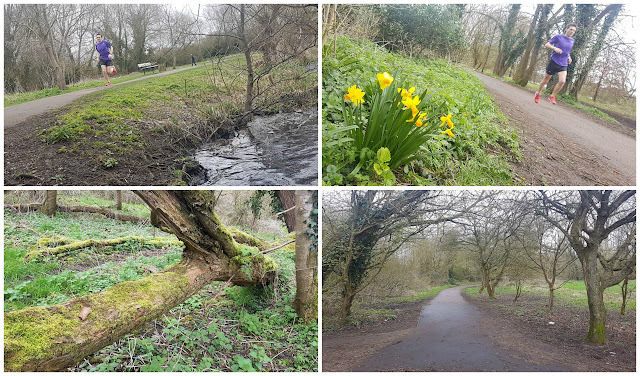 The rest of the reserve features areas of woodland and grassland which can be explored via a network of footpaths. There is also a cafe, dog-free picnic area and playground. 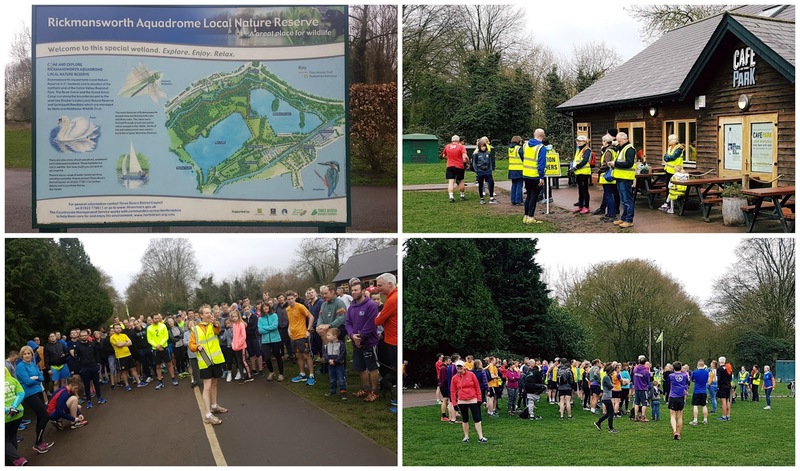 On 4th March 2017 the aquadrome became home to Rickmansworth parkrun, or as I heard a few of the locals say 'Ricky parkrun'. We travelled over to visit the venue on their third event and we parked in the car park which is just off Frogmoor Lane - it has space for 400 cars and is currently free-of-charge. The toilets and the cafe (Cafe in the Park) are located next to the car park as is the meeting and start point of the parkrun. If we had travelled by public transport we would have taken the train to Rickmansworth station which is located a short walk away, in the town centre. Cyclists can secure their bikes to one of the many bicycle racks which are located outside the cafe. Underfoot is a mixture of tarmac and slightly bumpy, stony footpaths - the surface is firm all around the course, so road shoes are the way to go. As it stands, at time of writing, the start-finish area is slightly different to the map on the official course page - I always record the course data using some kind of GPS device, so you can view the data if you want to see the actual course as was run at event #3, here on Strava - Rickmansworth parkrun #3. Just before 9am, the first-timers briefing, followed by the full briefing were held on the grass outside the cafe. The day's 267 participants then relocated to the start line a bit further along the tarmac path, which is still officially Frogmoor Lane. It's worth pointing out that this part of Frogmoor lane is used as a vehicular access road for members of the sailing club whose car park is at the far end and it seemed to be in pretty frequent use. 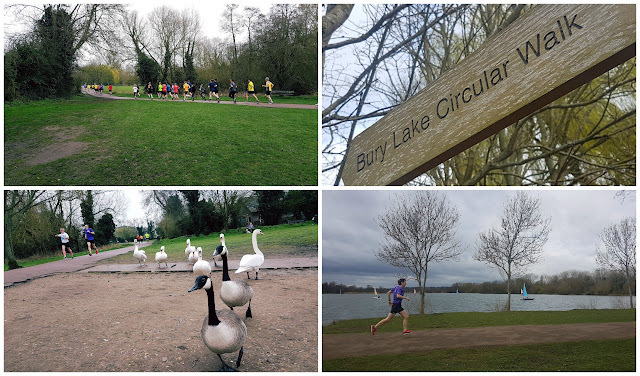 Once the day's runners had parted to allow a vehicle through, we were sent on our way for a very pleasant journey on a two-lap (plus the start-finish tail), meandering, clockwise course around the aquadrome. After about 150 metres the course takes a left hand turn and we were away from any potential vehicle interaction. At this point, the runners effectively run between the two lakes (you can only see one). There is a bird feeding area on the left and some of the waterfowl are quite often on the path - watch out for their little, slippery, poopy presents. This section is the 'Bury Lake Circular Walk' and it guides the runners around to the northern side of Bury Lake where the surroundings eventually start to become more wooded. About 800 metres into the lap, the course turns away from the lake and heads north where it meets the River Colne. The runners now follow the meandering, path (still tarmac) through woodland with the river to their left. When the runners reach the northern tip of Batchworth Lake, they are 1.5km into their run and join the Batchworth Lake Circular Path which weaves its way around the eastern bank of the lake. Around this point, the tarmac path changes to a slightly bumpier, stonier path for a few hundred metres. The River Colne is still to the runner's left along here, and eventually the runners reach a right hand turn (just a whisker over 2k into the run) where the Colne meets the Grand Union Canal - you might catch a glimpse of it through a small doorway in the corner. Now running along the southern bank of Batchworth Lake, the lap is almost complete. 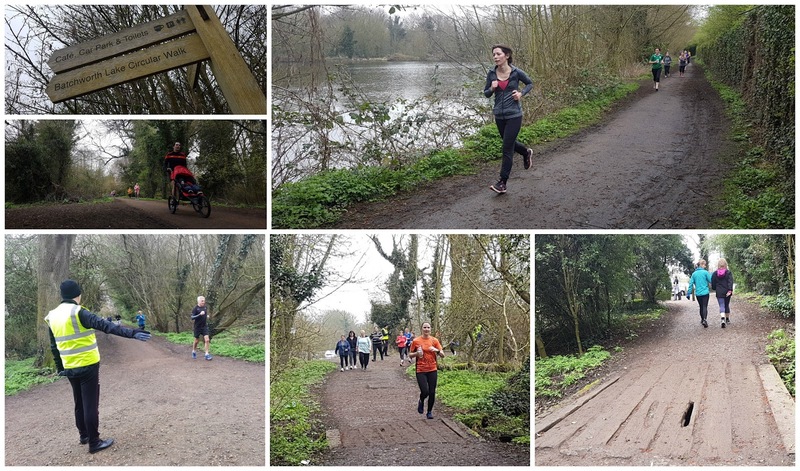 A small section of woodland is negotiated which includes a tiny bridge (be careful of the hole in one of the planks) after which the route pops out on Frogmoor Lane for about 50 metres and the second lap begins when the runners rejoin the 'Bury Lake Circular Path'. Another note I will make is that the park is very popular with dog walkers and I had a few moments where unleashed dogs ran across my path. Once both laps are complete, the runners head back along the start-finish straight (again, keep an eye out for vehicles along here - there is a section for pedestrians but it's not always possible to stay in it due to its design) where they will find the finish line manned by the rather wonderful volunteers. A scanned barcode and finish token later, the hard work of the morning was complete and it was time to head into the Cafe in the Park for some well-earned refreshments. We had an expensive, but lovely breakfast and the coffee was out of this world. They also had a cool selection of children's books that really kept us all occupied. After breakfast we hung around for a bit longer and watched the boats sailing on Bury Lake, and the sounds of the water lapping onto the shore were nice and relaxing. 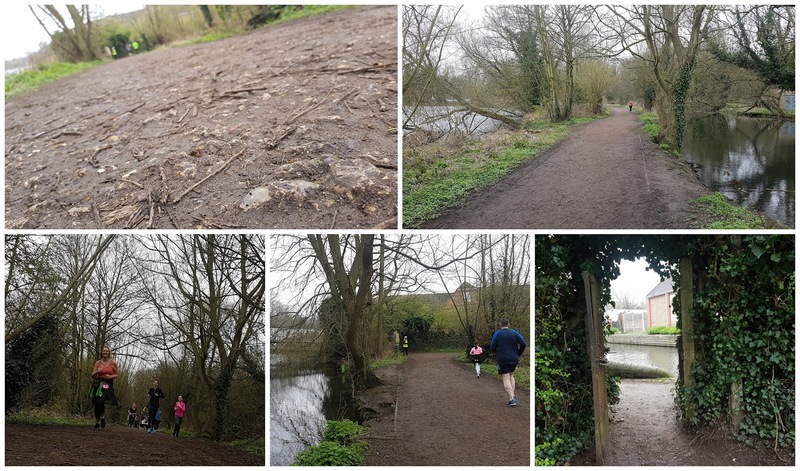 The results for event #3 were processed and online shortly after the run and I was pleased to have re-completed the Hertfordshire set and the London set (within the M25 version) of parkruns on the same day. We left at about midday having had a really nice morning out and headed towards central London for a family birthday. While driving along the A40 we saw the four huge man-made hills that reside in Northala Fields Country Park and I told my wife and daughter the story of their origin which tied in very nicely with the venue we had just visited. If you don't know the link, have a read of my Northala Fields parkrun blog.